Domino's Pizza teams up with Lionsgate to offer movie downloads | What Hi-Fi? Yes, you read that correctly: Domino's Pizza has teamed up with Lionsgate UK to provide a video-on-demand service with its core pizza business. 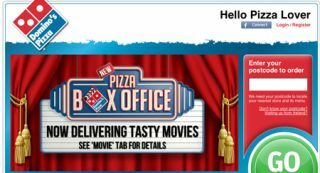 Domino's Pizza Box Office allows customers to order their favourite pizza and a host of popular films online via the Domino's website. You can choose from a range of pizza and film deals and confirm the order to receive a special code to begin downloading the film to your PC, Mac, mobile or tablet. Films will be available for viewing at the same time as they are released for DVD rental. At launch, top films on offer from Domino’s Pizza Box Office will includeThe Hunger Games and What to Expect When You're Expecting, as well as Scream and Dirty Dancing. More films will be continually added to Domino's service. Simon Wallis, sales and marketing director for Domino’s, says that pizza and film are “a match made in heaven”.